Rosetta’s navigation camera obtained the four images in this mosaic on Dec. 7, 2014, from a distance of 12.2 miles (19.7 km) from the center of Comet 67P/Churyumov-Gerasimenko. Asteroids, not comets, may have delivered most of Earth's water to the planet when the solar system was young, new data from a probe orbiting a comet suggests. Comets are some of the solar system's most primitive building blocks, with many dating to soon after its formation. Scientists think that these dirty snowballs probably helped seed Earth with key ingredients for life, such as organic compounds. Now, Rosetta has helped solve a mystery about how Earth became the watery world it is today. Before Rosetta began orbiting Comet 67P/C-G in August, it was using an instrument known as ROSINA (short for Rosetta Orbiter Spectrometer for Ion and Neutral Analysis) to analyze the chemical fingerprint of gases in the comet's fuzzy envelope. Scientists focused on data from the instrument regarding water to help uncover whether asteroids or comets delivered the water in Earth's oceans. Models of Earth's birth suggestthat the planet was quite hot after its formation about 4.6 billion years ago, so scientists think it's unlikely that any water currently on Earth's surface dates back to the time of the planet's creation. However, prior studies have hinted that cosmic impacts could have easily brought water later, during a violent era known as the Late Heavy Bombardment, about 800 million years after Earth's formation. To uncover the source of Earth's water, scientists look for bodies elsewhere in the solar system with similar water. Out of every 10,000 water molecules on Earth, three are not normal water molecules, but instead are so-called heavy water molecules. To see if comets might be the source of Earth's water, in 1986, the ESA probe Giotto flew by Halley's Comet, becoming the first spacecraft to make close observations of a comet. It discovered that Halley's Comet had twice the amount of heavy water compared to normal water as Earth does. But the Oort Cloud is not the only source of comets in the solar system. Another home to the dirty snowballs is the disc-shaped Kuiper Belt, which extends from about 30 to 55 times the distance of Earth to the sun. In 2011, data from ESA's Herschel Space Observatory revealed that Kuiper Belt comet 103P/Hartley 2 had a deuterium-to-hydrogen ratio "that matched terrestrial water's perfectly," Altwegg said during a news conference Tuesday (Dec. 9). "The Hartley 2 measurement — that was a real big surprise." Now, Rosetta has provided data from Comet 67P/C-G, another Kuiper Belt comet. However, Rosetta has discovered that this comet possesses an even higher deuterium-to-hydrogen ratio than seen in Oort Cloud comets — three times the amount of heavy water compared to normal water as Earth has. If Earth's water had come from Kuiper Belt objects — even if most of them were like comet 103P/Hartley 2 — and if only a small fraction were like Comet 67P/C-G, Earth's deuterium-to-hydrogen ratio would be significantly higher than it is today. "This probably rules out Kuiper Belt comets from bringing water to Earth," Altwegg said. Instead, most of Earth's water was probably delivered by asteroids, Altwegg said. The asteroids seen now "have stayed in the vicinity of the sun for 4.6 billion years," Altwegg said. "They've lost water due to the sun, due to heat. But to start with, they might have had much more water than they have now." Future analysis of ice-rich bodies in the asteroid belt could shed light on whether Earth's water really did come from there, Altwegg said. The differences seen between Comet 103P/Hartley 2 and Comet 67P/C-G suggest that Kuiper Belt comets are much more diverse than previously thought. This could mean that "they were probably not all assembled in the same location in the solar system," Altwegg said. Kuiper Belt comets with relatively low deuterium-to-hydrogen ratios might have formed close to the sun, where solar warmth may have helped them lose deuterium, while those with relatively high deuterium-to-hydrogen ratios might have originated farther away. In the future, when Comet 67P/C-G flies closer to the sun, the scientists hope to fly Rosetta through a jet of gas that the comet will give off as it gets warmer and more active. This will help reveal if the deuterium-to-hydrogen ratio seen from the water near the comet's surface is the same as that from near its core. "Hopefully, we'll get to fly directly through a jet [in the] summertime [of] next year," said Matt Taylor, ESA Rosetta project scientist. Scientists are also still on the lookout for Philae, which made a bouncy landing on Comet 67P/C-G's surface in mid-November. The refrigerator-size probe's anchoring harpoons did not fire as planned during touchdown, and it bounced off the comet twice before settling down on its surface. It broadcasted scientific data for about 57 hours on the comet's surface before its primary batteries ran out. 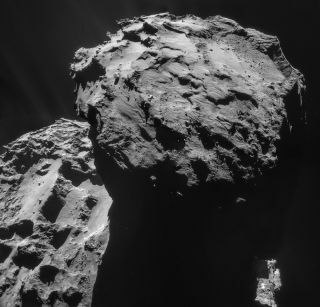 ESA officials aren't sure where Philae is now. Panoramic images from the probe reveal "one side of the lander appears to be in a hole," Taylor said during the news conference. "I see an overhanging clifflike structure." A radio instrument known as CONSERT, short for Comet Nucleus Sounding Experiment by Radiowave Transmission, on both Rosetta and Philae has narrowed the lander's position to a strip a few hundred feet long by a few dozen feet wide. "We're using that to kind of nail down where we think we should be looking harder," Taylor said. "Once we get identification of where the lander is, that will give us a better fix on what we believe the illumination conditions are and a better idea of when we should expect the lander to have sufficient illumination to start charging its batteries and come back online." A "back-of-a-beer-mat calculation" suggests Philae might come back online around May, Taylor added. The new comet findings are detailed in this week's issue of the journal Science.